I'm not a big designer junkie nor would I ever skip sleep to line up outside of a store for an exclusive collection launch. Having said that, "I love a good bargain" just like anybody else and I was absolutely thrilled to find out that Missoni was doing a collection for Target. So, not only do I love Target and shop there practically every day, Missoni is one of very few luxury brands that I lust after. 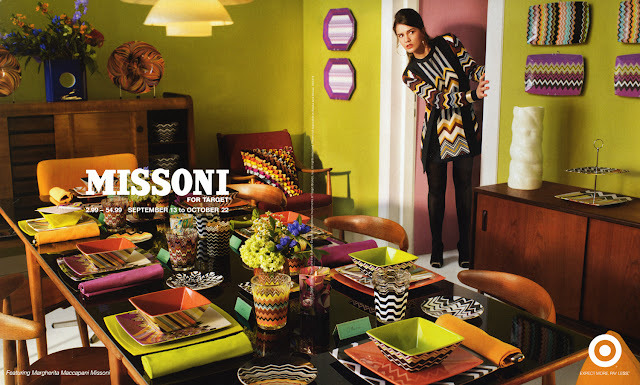 I respect Missoni as a brand, I love its history and family tradition; not to mention, I find their signature zigzag textiles simply genius!! On the day of the launch, my mom picked me up a pair of suede wooden heel shoes as seen on one of the Missoni heirs in the above left picture. I was so excited and content that I didn't even care to go to Target myself... I knew that the collection would be sold out on the day it launched so I was happy with what my mama got me :)) My bf and I went later that day only to discover a sad Missoni rack filled with Mossimo clothes (a permanent Target line). Turns out that every Target in the New York area was sold out within two hours of the store's opening and the craze even caused the Target website to crash. What a freaking success!!! To create this nail design, I swiped a few horizontal lines across my nail beds and waited for them to dry. Then, I took my Sally Hansen nail art pens in gold and black and drew the zigzags across the parts where the colors met to hide the straight lines. I won't lie and say this was easy, especially painting with my left hand on my right , but if you've got an artist in you, your skills will definitely help you out a lot. 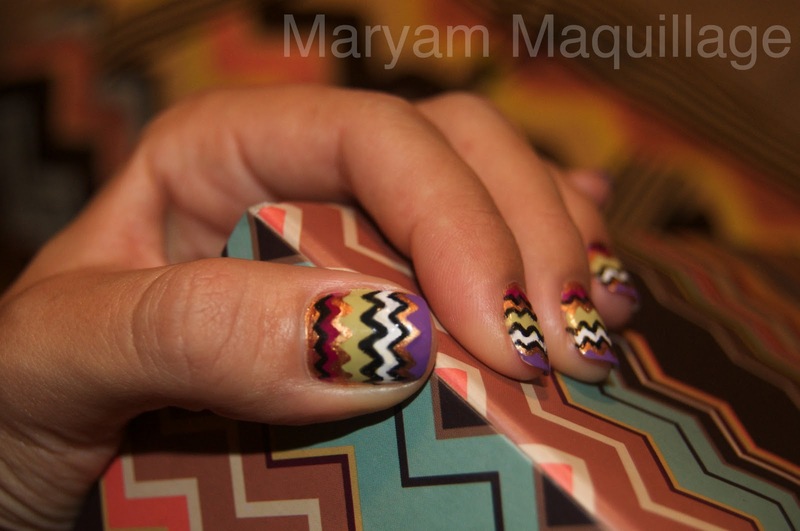 Sure, I made some mistakes and my nail polish ran here and there, but for the most part, I'm proud of this nailart and am really excited to share it with you :))) Here's the rest of me in my very own ad--Maryam Maquillage for Missoni 4 Target!! What's your take on designer clothes (duds), Missoni, nail art or any of the aforementioned? Oh my!! LOVE it! And that skirt is just adorable! :D I wish I still lived in the US sometimes..I miss Target! i love it!!! And I love the dress too!! So sad not to have a Target in Italy!! Some of their stuff is cute! Ahhhh I am in love with your nails. They are seriously amazing!! I so want to try this (but first need to learn how to paint my nails properly). I'm not a huge fan of the missoni collection but I do like your skirt. Ahhhhhhhhhmazing! This is too cool! Oh my God, I love this post!!!! I love your tribute to Missoni and the last 2 pics...you're so beautiful and stylish! LOVE the pictures! You are one hot mama! I really love how the design came out on your nails~ Simply fabulous. amazing! you must have really good patience! Love the nails! Idk if I'd be able to do that...or even if I managed too my right hand would like awful! I'm jelly of your skills girl! You are just SO GORGEOUS! You totally look like a model for Missoni! And those nails!! You are just so talented woman!! wow! your nails are amazing, and LOVE the skirt! omg i died! 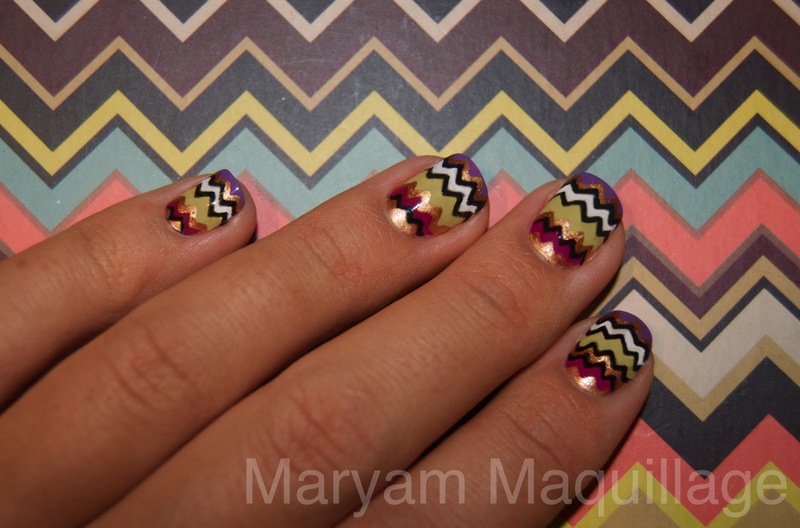 you look amazing in that skirt and those nails make missoni proud! Hiya my darling!!! i love your nail art it reminds me of the 60's funky and wild. and i love the two pictures of you the bottom one is so beautiful! OMG. You should be a model. You look so AWESOME, hottie. holy sh*t that's awesome! i'd never succeed in doing my right hand though. i'd end up really, really frustrated and angry! Great skirt and awesome job on the nails!!!! I really, really wanted this sparkly ribcage dress when the Rodarte for Target collection came out. Unfortunately, There is no Target in Canada and I missed out on getting it online.